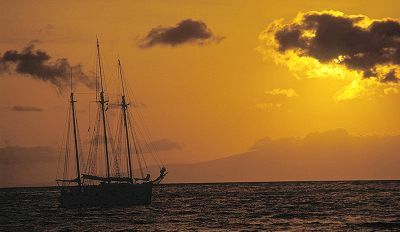 Eight miles from Maui, across the historic whaling anchorage at Lahina Roads lies the pear-shaped island of Lanai. This island was formed by an extinct volcano, and resembles the famous humpback whale. Island Collections 565-6405 This store is in Lanai City, and offers paintings and sculptures down by artists on the island that show the plantation culture that is now becoming Lanai's legacy. Club Lanai 871-1144 This is a club that caters to visitors from Maui. You can take a boat from the Lahaina pier and spend a day at Club Lanai. Club Lanai offers a dining area and bar, equipment for beach and watersports, snorkeling in it's coral reef, and lessons on how the visitor can learn Hawaiian arts and crafts. Hotel Lanai 565-7211 This is a mountain retreat 1600ft above sea level, surrounded by Norfolk pines. Built in the 1920s, it offers medium sized rooms complete with private bath. Manele Bay Hotel 800-321-4666 This is a traditional beach front resort. It offers spacious rooms, done in pastel hues and decorated with Asian armories and of Hawaiian flora. This is a very elegant hotel. Blue Ginger Cafe 565-6363 This cafe rests in an old plantation house. Pool Grille 565-7700 This restaurant sits on a bogainvillea-covered terrace. Hulopue Court Restaurant 565-7700 This restaurant's doors open onto a verandah overlooking the ocean. Ihilani Dining Room 565-7700 The menu here features a French-Mediterranean cuisine. They offer dinner only, and formal service. If your idea of an island getaway includes ultra luxury and secluded privacy, the Island of Lanai awaits you. Just over 3,000 people live on this small island. Life evolves around its one charming town, Lanai City, and two deluxe properties, the upcountry Lodge at Koele and the ocean side Manele Bay Hotel. Both consistently win top resort honors. Two stellar golf courses, a spa, fine dining choices, and plenty of outdoor activities and water sports guarantee there’ll be plenty to do until its high tea in the music room. In Lanai, you can travel miles of wonderful soft-sand beaches in solitude, snorkel and swim in warm pacific waters, beach comb, and whale watch. You are likely to see vacationing celebrities as well as friendly locals who will talk the time to 'talk story'. You can visit the otherworldly 'Garden of the Gods' or adventure to Shipwreck beach where the rusting hulls of ships still sit where they ran aground. There is more to Lanai than the resorts, and no matter what you choose to do, you will treasure your stay at Hawaii's top fantasy destination!